It really is typical… all week I had been stuck inside working, looking out the window at the clear skies and sunshine, wishing I could be outside in the hills. Then came my only chance to get away for a few nights in my tent, and I consulted my various weather apps only to find that every single one predicted the likelihood of rain, sleet and snow! Being a complete beginner at camping in the wild, and not knowing quite what to expect, I was understandably unnerved by that development. Nevertheless, my bags were already packed, I had my camping spot picked out, and I was determined to finally take the dive head first into wild camping. After all, the first night I ever spent in a tent was during a hurricane and I tried to repair a broken pole with a chop stick….but that’s another story. 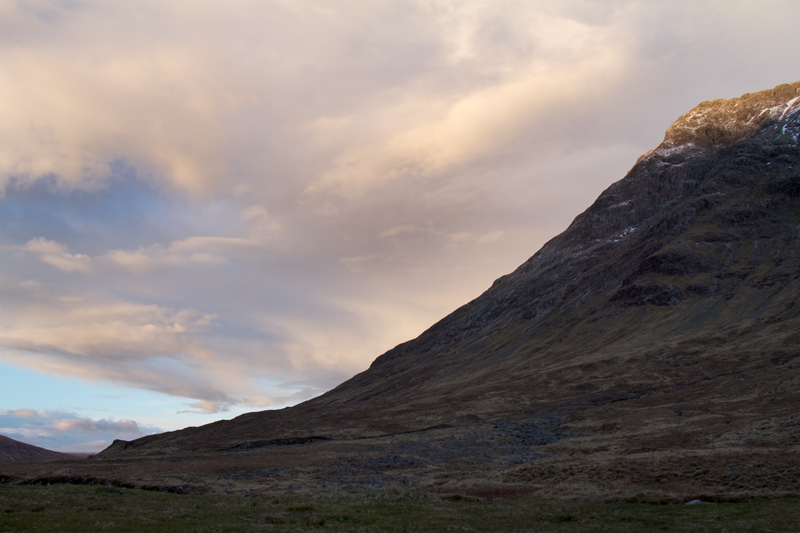 In the morning I packed the last few items into my bags (mainly extra layers and even more food) loaded up the car, finalised my playlist, and just before I left, I went online to check the Glencoe Mountain webcam. No matter adamantly you tune into the forecasts, the webcams are the only way of really knowing what the weather is currently doing at any given moment, and much to my relief they showed me that there was no snow lying on the ground where I planned to stay the night. So with my mind at ease I set off up North! 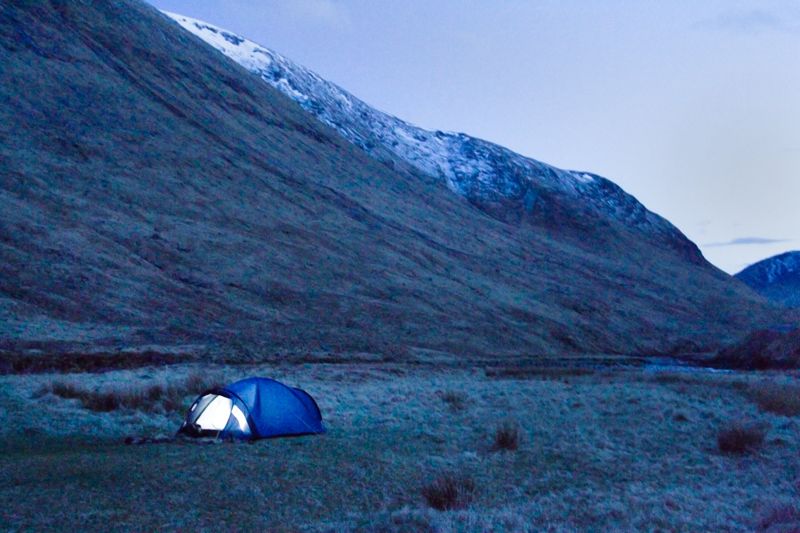 I had already come up with a few potential camping spots on my last trip up the glen, so all I had to do this time was pick one which was the least waterlogged and free of other campers. I soon found a nice spot not far from the road, down by the river. After 15 minutes or so, I had my site all set up and ready to withstand all that Mother Nature could throw at me (I hoped), so I didn't waste any time and headed off to find a suitable place to get some shots the next morning. One of the spots I discovered was this view, just below the Ballachulish Bridge looking west towards the Morvern Hills. I liked the way the rain was passing over the peaks and the light was breaking through the clouds in patches. With the incoming rain, I made my way back along the road to try and escape it, stopping off in Ballachulish to scout out a view of the Pap of Glencoe but from there I looked back toward the bridge and was able to capture this silhouette view with the rain still moving towards me. From there I decided to drive around Loch Leven where it's fair to say the weather was somewhat changeable. I stopped to catch the light on the Pap across the loch, but there was something about the clouds above Kinlochleven, this tree sticking out over the water, and the absence of colour that really drew me to this scene. Every time I stopped the car to rush to the shore to grab whatever shot was unfolding in front of me, I promised myself that it would be the last, and that I would head back to the tent to settle in, sort some dinner and just enjoy where I was. And every single time I found another shot that I couldn't pass up! When I finally arrived back at my tent to start dinner, I passed a group of about 8 or 9 deer down by the river only 100 yards from my tent. This is the sort of thing I've always dreamed of when I think about camping out in the wild. As I began settling in for the night I was treated to these views from my tent of the sun going down and creating some magnificent sights in the sky. Once I was fed and the sun was down, I decided to turn in for the night: content with stunning views, a small fire and a good book, I called it a day at 10pm ready for a trip out in the morning. After a thankfully calm and not too cold night, my alarm went off at 4:30am. I stumbled out my tent and staggered up the slope to my car. 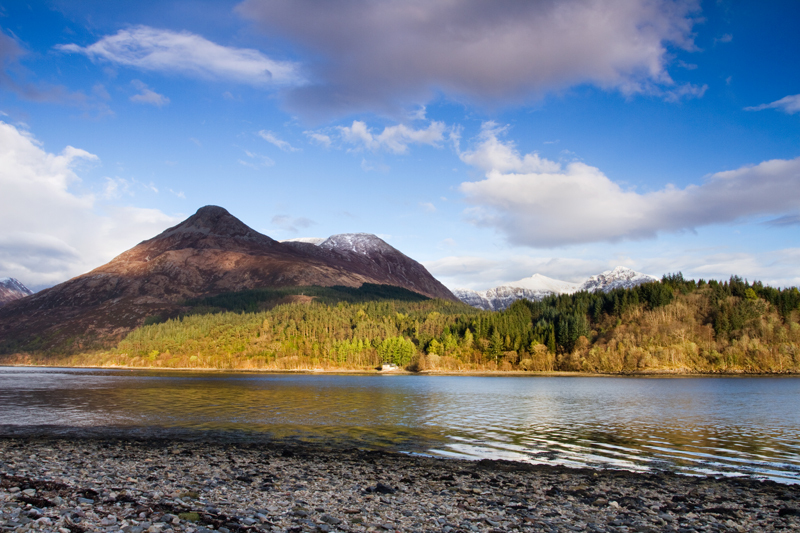 I made the drive back along the Glen Etive road, carefully avoiding what seemed like every deer in the highlands, I joined the A82, and was soon at the spot in Ballachulish looking towards the Pap of Glencoe that I had scouted out the day before. As I stood next to Loch Leven, waiting for the sun to make an appearance, there was a point where I thought that the solid cloud wasn't going to shift and that the whole morning would be a bust. But just 5 minutes before the sun was due to rise, the clouds began to break up which created some great reflections on the loch. Despite the break in the clouds, I didn't get the pre dawn colours that I was hoping for, however, as I wandered around the beach where I had set up, something to the west caught my eye. Once the clouds began to close in and the sun disappeared again, I started to make the drive back through Glen Coe to find myself some breakfast, but I just couldn't resist stopping to catch some photos of the morning light up the glen. 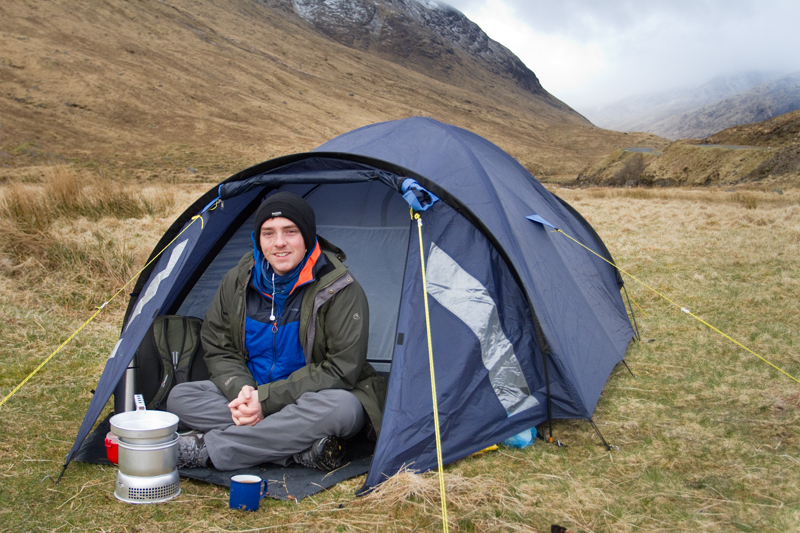 When I arrived back at my tent in Glen Etive, and got the stove on to make some porridge, the clouds that were hanging around Loch Leven earlier had clearly found my camping stop. 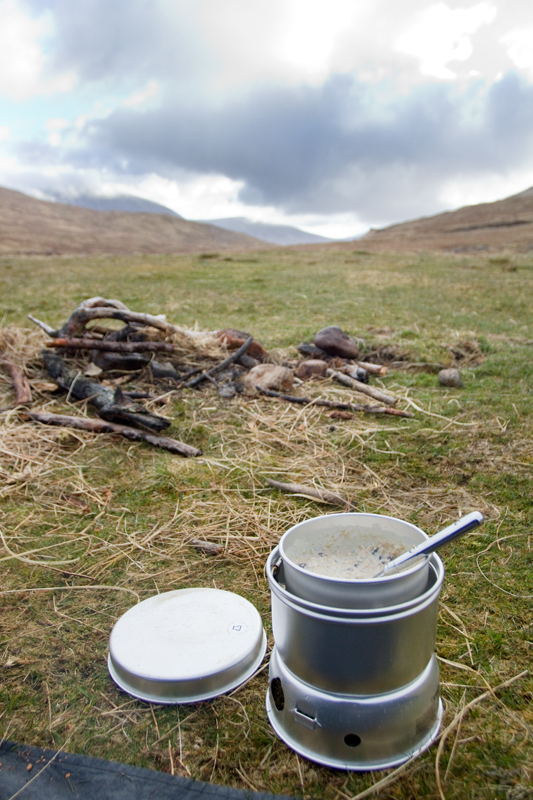 On the whole I consider myself lucky that the only poor weather I experienced was nothing worse than a little light drizzle after my successful morning, and was able to hunker down in my tent with a hot cup of tea and some porridge. As for my first ever wild camping trip, it was a great experience and something I have wanted to tick off my bucket list for a long time. I’ve learned a lot from this trip that I hope to be able to put to use this summer.